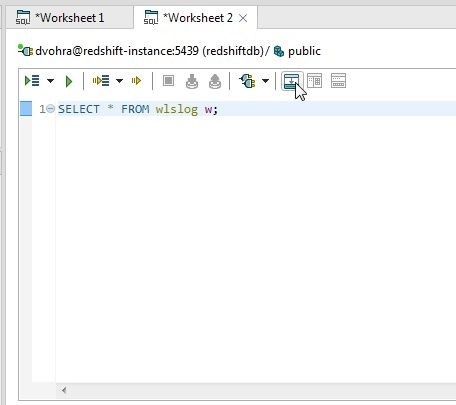 Amazon Redshift is a data warehouse service hosted by AWS. Redshift is a columnar data storage RDBMS database with support for storing petabyte-scale data. 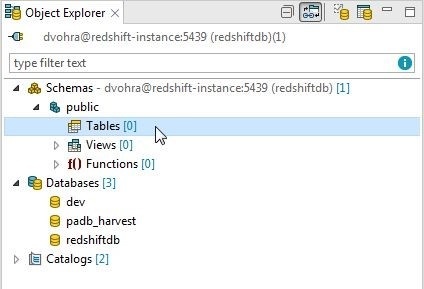 Redshift is typically used to run complex data analysis queries run across a cluster of nodes. 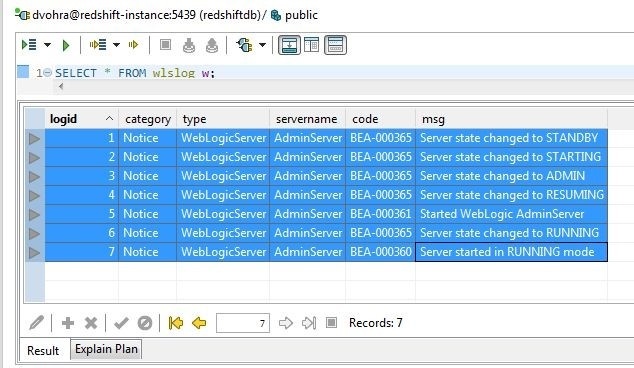 Redshift is based on PostgreSQL 8.0.2 and gets some its features such as the public schema from PostgreSQL. In an earlier article we discussed creating a connection to Redshift with Toad Edge. In this continuation article we shall discuss some of the Toad Edge features for Redshift. 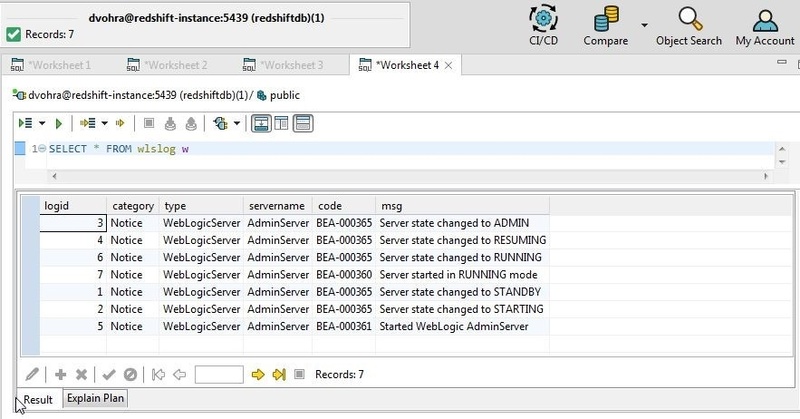 Toad Edge supports several databases, including MySQL and PostgreSQL, and some of its features are different for different databases. This article has the following sections. In this section we shall create a database table and add table data. The following SQL script creates a table wlslog. 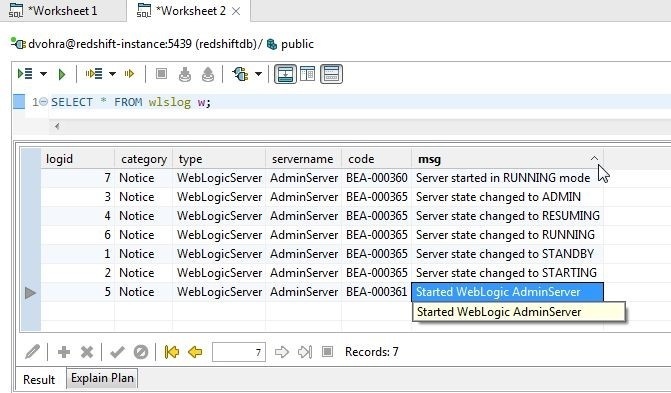 Copy and paste the SQL script into a worksheet and click on Execute>Execute All statements in the toolbar as shown in Figure 1. 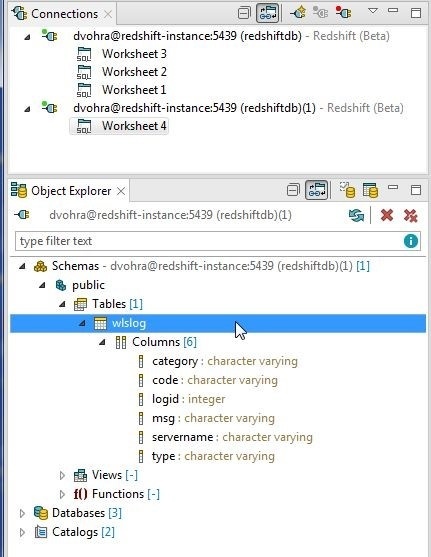 Alternatively, select Execute All Statements in the worksheet toolbar as shown in Figure 2. 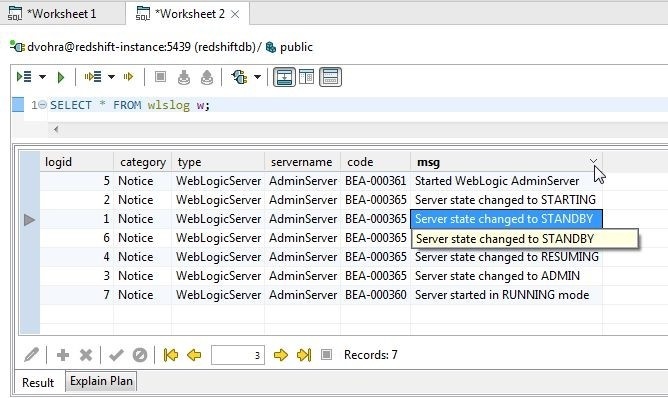 The SQL statements get processed and the table wlslog gets created, as shown in Figure 3. The various options available for a new table are Refresh, Drop, and Cascade Drop, as shown in Figure 4. 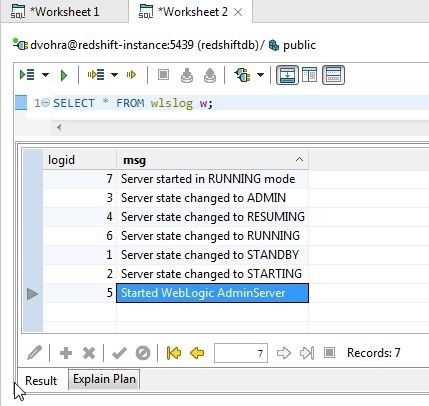 Right-click on the wlslog table to display and use the options. In this section we shall query the table created. 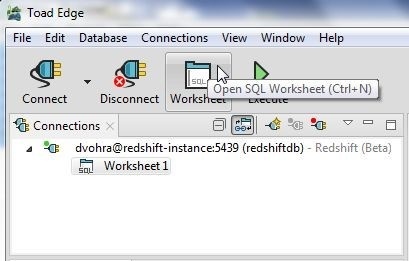 Open a new SQL Worksheet by selecting Open SQL Worksheet in toolbar as shown in Figure 5. 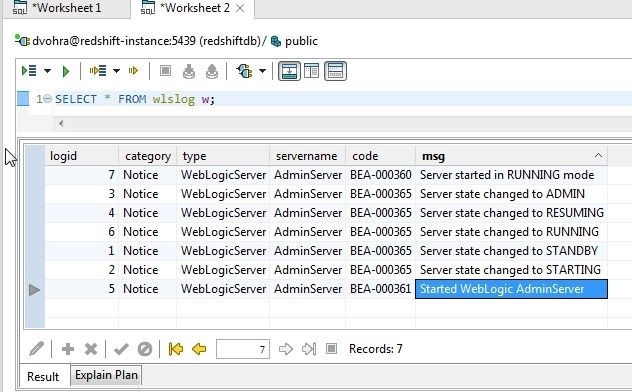 Add SELECT to the worksheet and using code completion feature of the worksheet select * as shown in Figure 6. 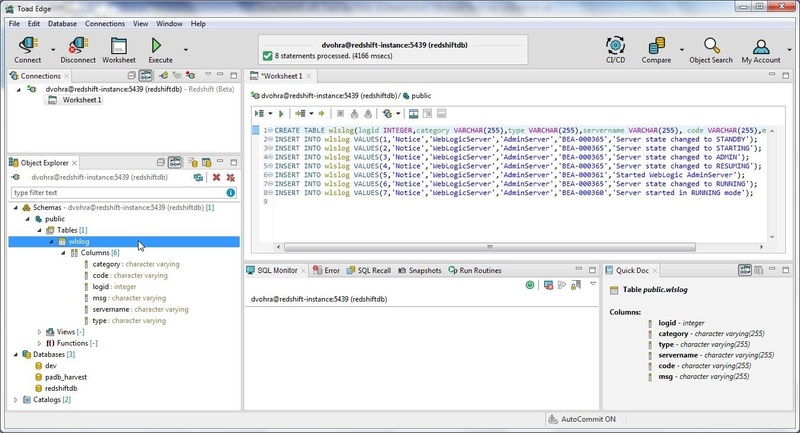 Add a space and code completion displays the options available; from which, select FROM as shown in Figure 7. Using further code completion select the wlslog table as shown in Figure 8. The complete SQL query statement is shown in Figure 9. Optionally add a “;” at the statement end. 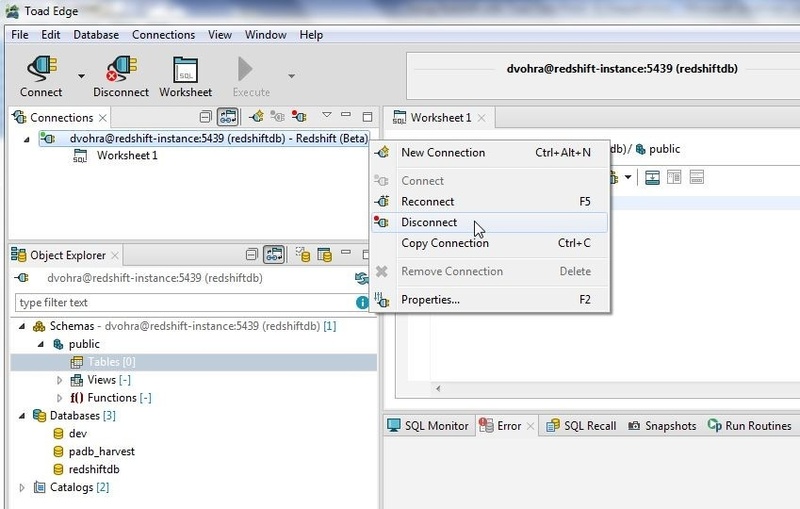 Click on Execute SQL Statement to run the statement as shown in Figure 10. 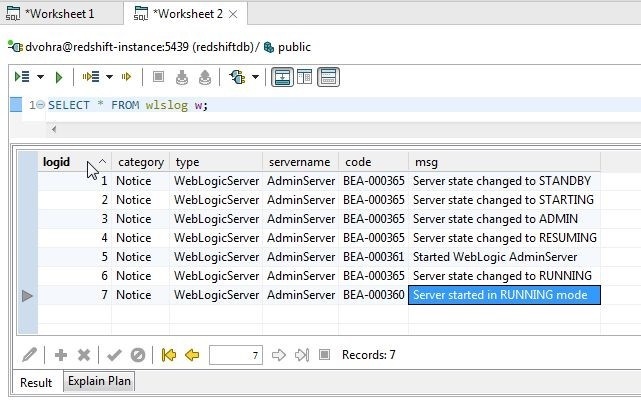 The SQL query runs and a Result Set is displayed, as shown in Figure 11. 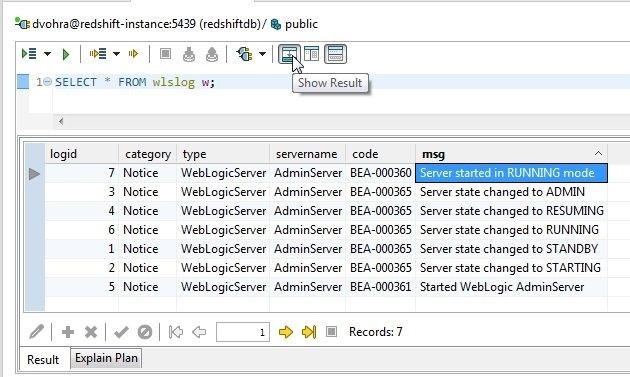 The SQL Recall lists the SQL Statements that have run successfully or have failed, as shown in Figure 12. The Show Result button shown in Figure 13 toggles between showing and undisplaying result. With result displayed click on Show Result. The result gets undisplayed, as shown in Figure 14. Click on Show Result again to redisplay the result. To hide an individual column right-click in the column and select Hide Column as shown in Figure 15. 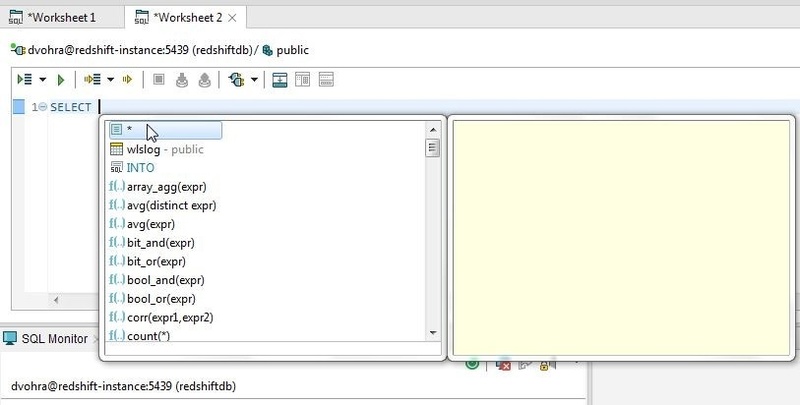 Hide Column is selected for the code column in Figure 15. The code column gets removed from the result set, as shown in Figure 16. Similarly, select Hide Column for the servername column as shown in Figure 16. Remove the category and type columns similarly to display only two columns in result, logid and msg, as shown in Figure 17. To restore hidden columns right-click in the result set and select Restore hidden columns as shown in Figure 18. All the hidden columns get restored, as shown in Figure 19. Columns may be hidden one at a time and restored together. Individual attribute or column values may be displayed in ascending or descending mode. As the attribute values are correlated with other attributes in a data record, setting one column in ascending/descending mode would modify the ordering of the other columns and each column cannot be ordered in ascending/descending mode independently. For numeric values ascending is from lower numeric value to higher numeric value and for non-numeric values ascending and descending are based alphabetically. Display the msg column values in ascending mode by setting the toggle to ^ as shown in Figure 20. To display in alphabetically descending mode set the toggle to v as shown in Figure 21. Similarly, the code column values are shown in descending mode in Figure 22. And the code column values are shown in ascending mode in Figure 23. The logid column type is a numeric data type and is shown in ascending mode in Figure 24. The logid column values in descending mode are shown in Figure 25. By default the layout of the Worksheet and the Result is Horizontal, as shown in Figure 26. To display vertically click on Vertical Layout as shown in Figure 26. 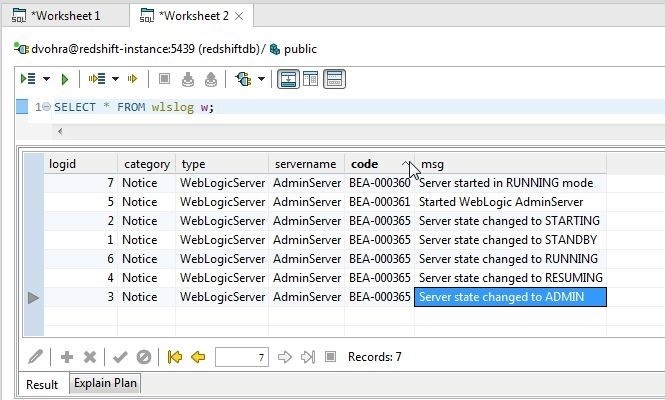 The SQL Worksheet and Result get displayed vertically as shown in Figure 27. To revert to horizontal layout select Horizontal Layout as shown in Figure 28. The layout gets reverted to horizontal as shown in Figure 29. A result set may be exported to one of the supported formats (CSV,HTML,SQL, and XML). The complete result may be exported or selected rows may be exported. To export the complete result right-click in the result set and select Export Result>CSV (or SQL) as shown in Figure 30. 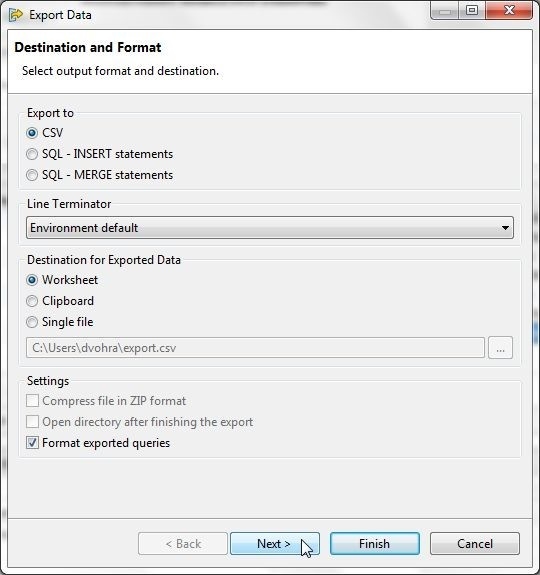 In Export Data select the output format as CSV and select Destination for Exported Data as Worksheet as shown in Figure 31. The export.csv file gets generated in the Users directory by default. With Format exported queries selected click on Next. 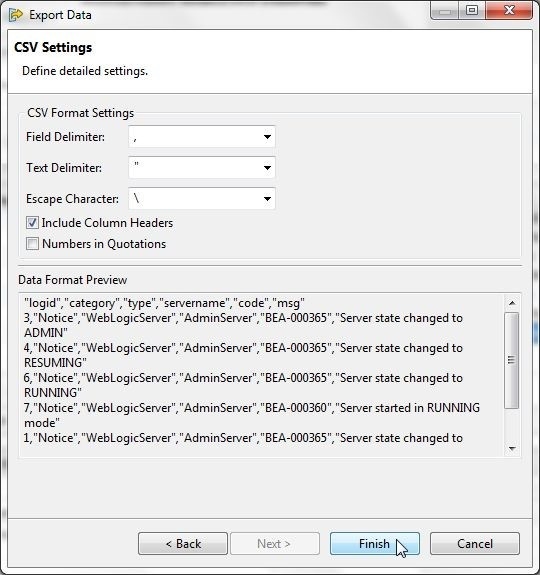 Next, define detailed CSV settings as shown in Figure 32. Keeping the default settings for Field Delimiter, Text Delimiter, Escape Character, and with the Include Column Headers selected, click on Finish. The CSV file exported is shown in Figure 33. As another example of exporting the result set, select a single row and right-click and select Export Selection>HTML as shown in Figure 34. In the Save As dialog specify a File name to save to and click on Save. 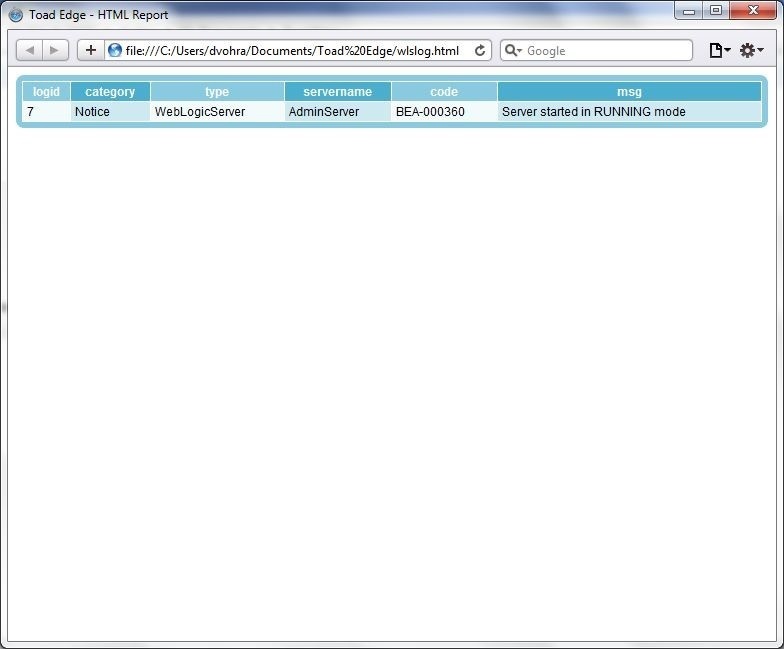 The HTML file exported is shown in Figure 35. To select the complete result select all the rows with Shift+Row. Right-click and select Export Selection>HTML as shown in Figure 36. Specify File name to save to as before. The exported HTML is shown in Figure 37. 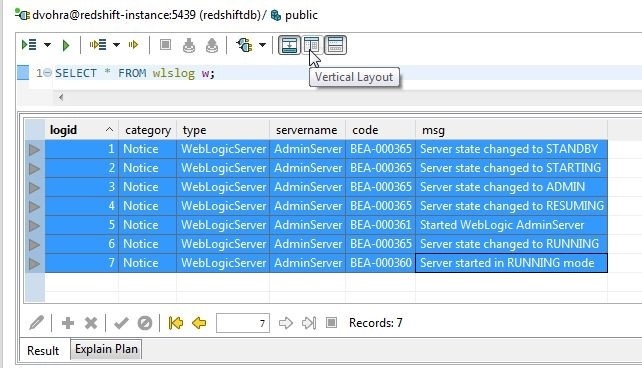 In this section we shall discuss using multiple connections to the same or a different Redshift cluster. Multiple connections may be created with New Connection or a connection may be copied. To copy a connection right-click on the connection and select Copy Connection as shown in Figure 38. The Copy Connection dialog has all the connection settings copied over from the connection being copied, as shown in Figure 39. Click on Test Connection to test the connection. If the connection gets established the message Connection is OK is displayed. Click on Finish. 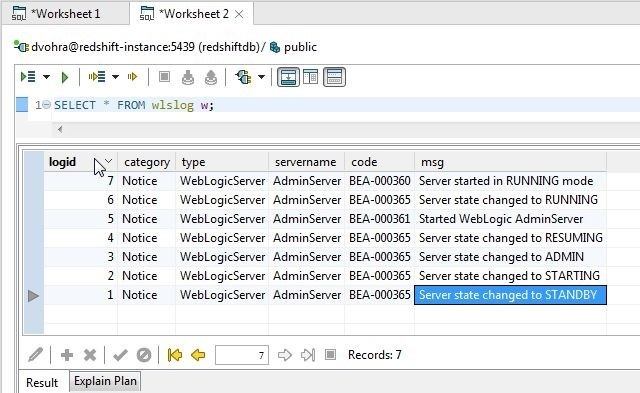 The copied connection is shown in the Connections view in Figure 40, with a SQL Worksheet associated with it. The tables also get copied to the new connection. The wlslog table is listed for the copied connection. The table data also gets copied. The wlslog table data is shown in Figure 41. The Connect in the tool bar displays both the copied and the copied-from connection, as shown in Figure 42. 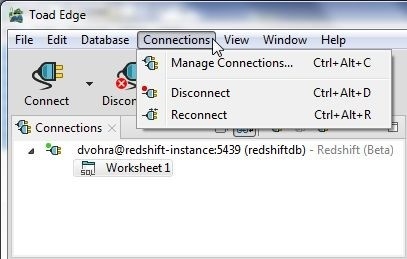 To disconnect a connection either select Disconnect in the toolbar or right-click on the connection in Connections and select Disconnect as shown in Figure 43. To connect again right-click on the connection and select Connect as shown in Figure 44. 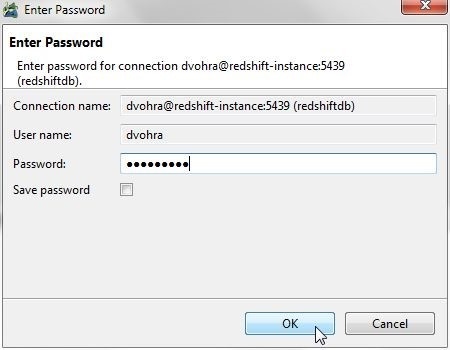 In the Enter Password dialog specify Password and click on OK as shown in Figure 45. A connection may also be connected and disconnected from the Connections drop-down, as shown in Figure 46. Disconnect Selected connection may also be selected from the Connections view, as shown in Figure 47. To remove a connection right-click on the connection and select Remove Connection as shown in Figure 48. Only a connection that has first been disconnected may be removed. 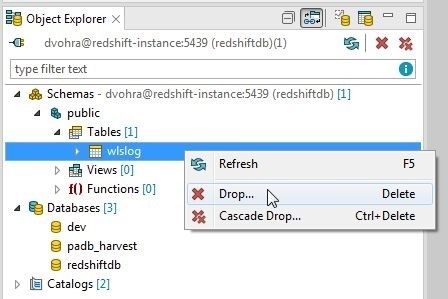 To drop a table right-click on the table in Object Explorer and select Drop as shown in Figure 49. Click on OK in Confirm dialog as shown in Figure 50. The table gets dropped, as indicated by absence of tables in Figure 51. 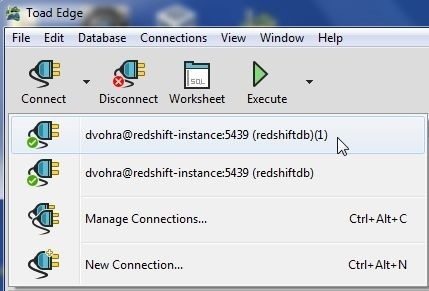 To delete a Redshift cluster select the cluster in the console and select Cluster>Delete Cluster as shown in Figure 52. In the Delete Cluster dialog an option create a snapshot is provided, as shown in Figure 53. To not create a snapshot select No for Create Snapshot and click on Delete. The cluster starts to get deleted as shown by the Cluster Status as deleting in Figure 54. If a snapshot is to be made select Yes for Create Snapshot and specify a snapshot name, and click on Delete as shown in Figure 55. A snapshot gets created, as shown in Figure 56. 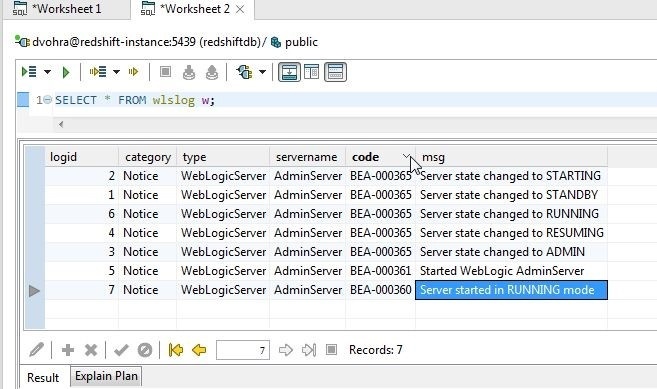 Only after the snapshot has been created does the cluster start to get deleted, as shown in Figure 57. 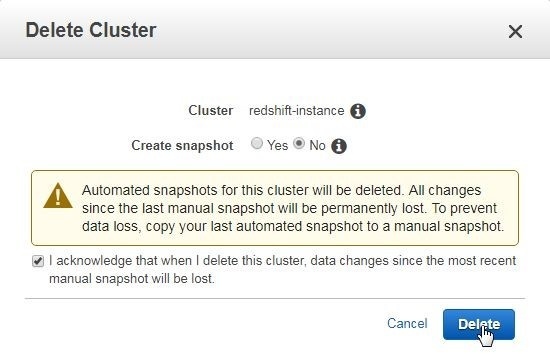 A cluster that has been deleted may be restored by selecting Actions>Restore from Snapshot as shown in Figure 58. 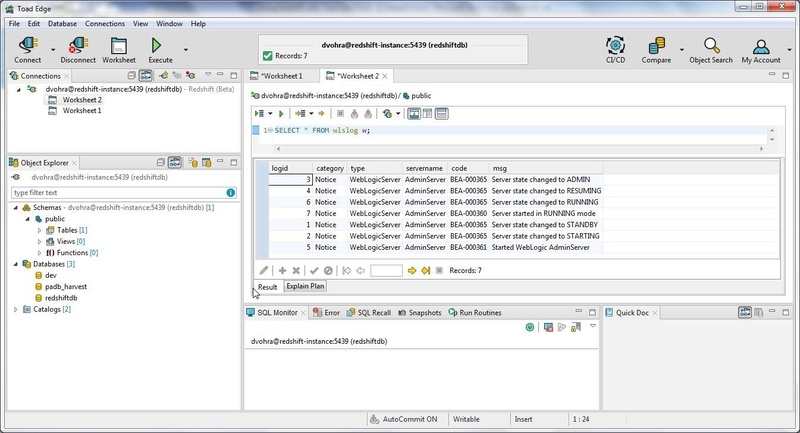 In the Restore Cluster from Snapshot dialog select the default settings as shown in Figure 59 or modify as needed. Scroll down and click on Restore. The cluster starts to get restored, as shown in Figure 60. 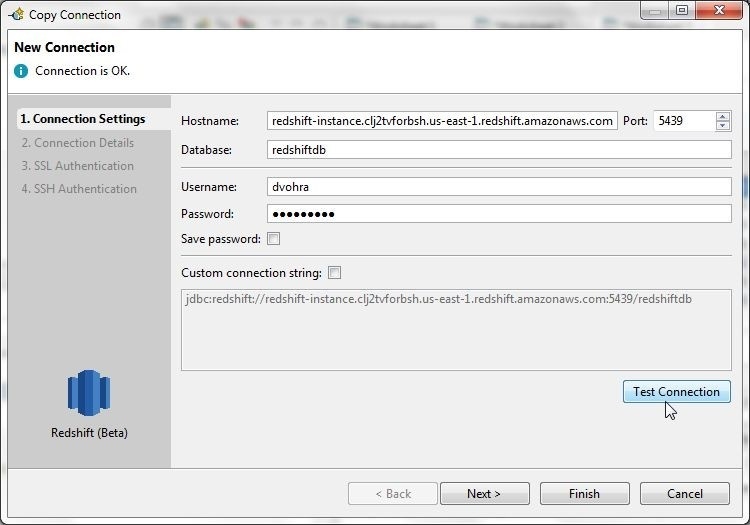 In two articles we have discussed using the Amazon Redshift data warehouse with Toad Edge 2.0.2. 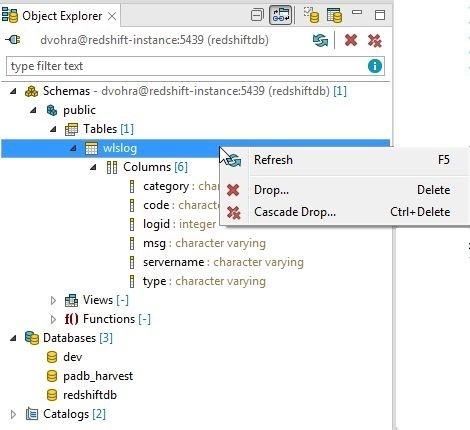 Toad Edge is one of the very few client IDEs for Redshift and provides all the features for Redshift that are available for the open source databases MySQL and PostgreSQL. Deepak Vohra is an Oracle Certified Associate, Oracle Database 10g, and Sun Certified Java Programmer. Deepak has published on OTN and in Oracle Magazine.